Casio ML2020 ML-2020 Accumulator Battery. Type: Sanyo Lithium Aluminium Alloy - Manganese Dioxide. Voltage: 3V. Height: 2.0 mm. Diameter: 20 mm. Price: £10.99 each. (£10.50 if you buy two or more). Postage and packing included. Functional replacement for: Sony / Panasonic / Sanyo Lithium Aluminium Alloy Manganese Dioxide (MnO2-LiAl) ML2020 Batteries. Compatible Models: Casio Atomic Solar Powered G-Shock watches, Casio Solar Powered Classic Watches, Casio Solar Powered Databank Watches and many others. This small rechargeable ML2020 battery is commonly used in Casio watches. For example some Casio SOLAR POWERED watches take these ML-2020 cells. 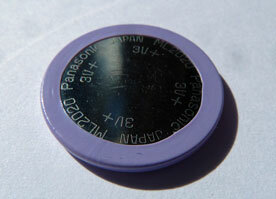 The ML2020 comes from the "ML" series of Lithium Manganese Dioxide batteries manufactured by Sony and/or Panasonic. Our Panasonic ML2020 replacement watch battery is manufactured in Japan. In most cases, replacement of the ML2020 battery is an easy task.